Mr. Jan Gordon’s Exposition in Nottingham. A Nottingham audience and Mr. Jan Gordon, the well-known art critic, waged a fierce battle of words in Circus-street Hall last night over the merits of the art of to-day. There was, he said in his lecture, no such thing as modern art. Art was for all time, and through all ages it sprang from the same sources. The artist was the man who saw most clearly in the world, and the realistic artist was usually acclaimed the greatest artist by the generations which followed him. Most the confusion in art criticism and art judgment to-day consisted in the confusion between desirability and beauty. Nine-tenths of the judgment popular pictures was made from this standpoint desirability, and from nothing else. What the public of to-day demanded was, firstly desirable beauty (which was prettiness); secondly, truth to Nature; and thirdly, cleverness or virtuosity. On the first point it was only necessary to draw attention to the inundation of the public with pictures of prettiness: pretty girls, pretty babies, pretty kittens, and pretty puppies. Prettiness, said Mr. Gordon in summing up, was an appeal from painting to our sense of the desirable: also it was a stimulus to our lack of imagination. All desirability was sensual. Dealing with some modern artists, said Mr. Gordon, the question was often asked, Why have these people chosen to desert the old traditions and to shock us with these travesties of nature? The answer to that was another question: What kind of problem are they trying to solve? And then we must remember that a problem when solved lost most of its interest. Of Post-Impressionism he said: "This is no new plunging forward and revolt, but a labouring after more direct methods of expression ; an attempt to play more markedly on the senses ; and to purify the art of painting from cleverness and the false ideas of realism." The lecture over, the audience's opportunity came. "Why are some of these pictures in the Castle so atrociously badly drawn?" asked one, to whom Mr. Gordon replied that he considered drawing as a copying of facts, easy to learn, and very invaluable to possess. "Are the painters who are represented in the Castle exhibition sincere?" was another question. Mr. Gordon explained that though he had not seen the exhibition he was certain from the names of the artists that they were all thoroughly sincere. Another member of the audience was even more pointed, declaring that many of the pictures in the exhibition were an insult to the public. "Exactly the same," said the lecturer, "was said of Rembrandt, of Whistler, and, musically, of Beethoven years ago. But we do not hold that view now." Would an unsophisticated person prefer these new pictures to Rembrandt, Turner, or Whistler? The lecturer could not say generally, but he could name a char-woman who fell in love with a Cubist picture, disregarding the older masters altogether. The lecture was arranged by the Nottingham Little Movement, and in the absence through illness of Lord Henry Bentinck (the president), Professor Granger occupied the chair. 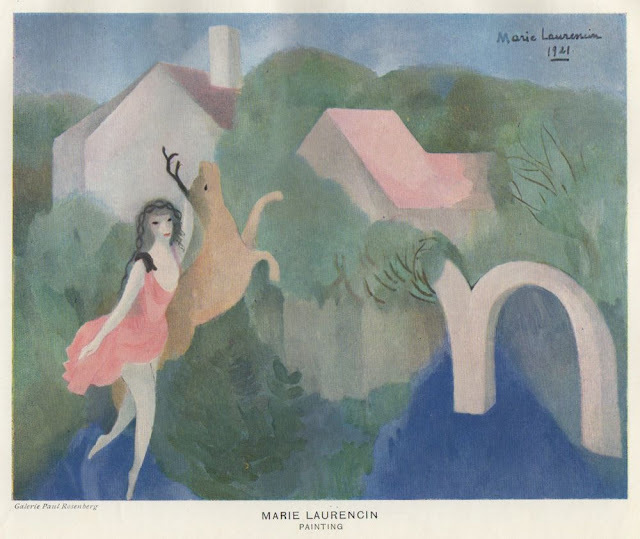 A Marie Laurencin painting reproduced in Jan Gordon's "Modern French Painters"